A survey published last week in The New York Times revealed that student affairs officials tend to lean left – but the verdict isn’t surprising to GW administrators. Samuel Abrams, a professor of politics at Sarah Lawrence College, conducted a report over the past two years surveying roughly 900 “student-facing” administrators and found that the majority of officials tend to be more left-leaning than faculty. But officials said they aren’t surprised by the report’s findings because student affairs professionals “tend to be progressive” to cater to different perspectives within the student body. 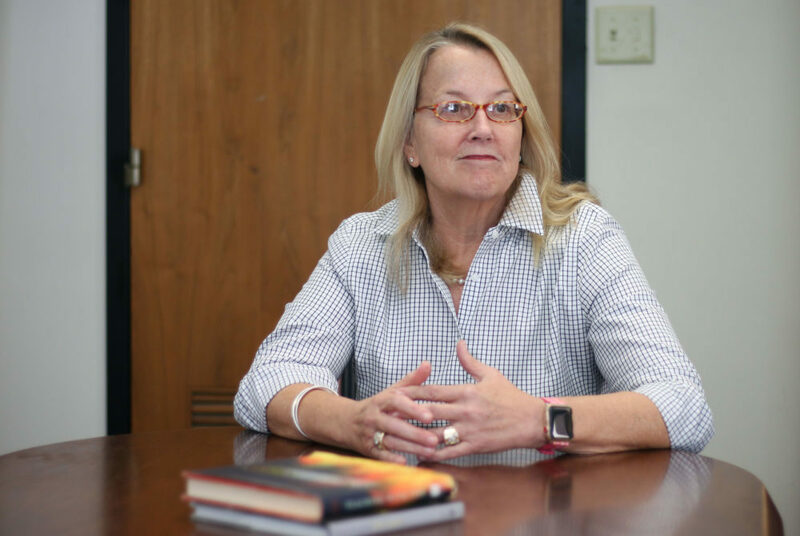 “Student needs tend to be ever-evolving and change over time, and student affairs professionals need to have the flexibility to adapt and change with them,” Cissy Petty, the dean of the student experience, said in an email. Petty retweeted the article last week with the caption “breaking news” and a rolling-eyes emoji. “I know we are in Washington, which is the center of politics, but in the few months since I have been here, the conversations I have had with my colleagues are about how we can work together to be there for all of our students, not about our political ideology,” she said. GW has often been marked as a generally liberal-leaning campus featuring the largest College Democrats chapter in the country. Conservative students have often considered GW’s student body as dominated by liberal students, as seen in its student government and general student body, they said. Political student leaders said that while student affairs officials may be more liberal, their political affiliation does not have an effect on organizations’ operations or impact on the student body. Bridget Anzano, the president of College Democrats, said the political ideology does not have any effect on the organization’s operations because they work with advisers to plan events and programming, not discuss politics. She said left-leaning officials could be a representation of a generally liberal student body because younger demographics of people tend to lean Democratic. Student affairs experts said the report demonstrates that college campuses need to cater to multiple different political ideologies because officials’ left-leaning ideology could only serve liberal students, hindering administrators’ abilities to understand multiple perspectives. Abrams, the professor who conducted the study, said conservative students could have a “limited college experience” if they are the political minority on campus because students come to campus to learn – a process that could be hindered if all students have the same political ideology. He said that at schools where the majority of student affairs officials are liberal, students could experience “groupthink” – an echo chamber of students and administrators that share similar views. Kevin Kruger, the president of NASPA, Student Affairs Administrators in Higher Education, told Inside Higher Education that historically, universities tend to bring in relatively progressive students, and officials try to promote “an equal and open dialogue” among political ideologies. “Are students treated fairly? Are different perspectives given equal footing? I would say there is no evidence to suggest that students affairs professionals block more conservative speech,” Kruger said. Banzhaf said student affairs officials who lean liberal could also be more lenient with students who behave inappropriately, pointing to a protest at the Board of Trustees meeting Friday, when members of Fossil Free GW interrupted University President Thomas LeBlanc’s speech to demand that the University divest from fossil fuels.